My mother rescued her pet beagle while in Mercer County, Kentucky, and had him shipped up to NY. He was vocal, stubborn, and obsessed with her. When she steered into a telephone pole, in what was to be her last drive, he was in the back seat and thrown onto the floor. Soon after this incident he began a steady decline and passed a few months later. Within that same year, my mother struggled with changes in her heart rate. The cardiologist increased her medications and added Digoxin. 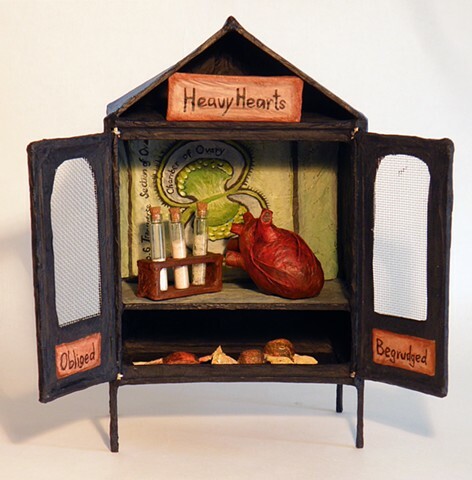 In Reliquary for Heavy Hearts, an anatomical heart is contained inside a dreamy cabinet, alongside vials of salts from around the world and a botanical study of Digitalis. Wrapped candies sit on the lower shelf, tempting treats for anyone within reach. The words, ‘Obliged’ and ‘Begrudged’ are written on the insides of the doors. This piece explores how my mother’s care for an abandoned creature compared and contrasted to her upbringing of my siblings and me.